A question I am frequently asked is “what should I do if the police invite me to the station for an informal interview?” (Also known as voluntary attendance). My answer is the same each time: Decline. As far as the police are concerned there is no such thing as an ‘informal chat’. Voluntary interviews are usually offered when the police don’t have enough evidence to make an arrest and are hoping that you will provide it for them. Police invitations to the station can be persistent and bullying, often resorting to the kind of aggressive tactics that would put some debt collectors to shame. They usually begin with a hand-written note dropped through your letterbox inviting you to phone them. These notes rarely make it clear what it is they want to discuss. If you ignore them, and they have your phone number, they may call you multiple times a day, threatening you with arrest if you don’t attend. They might repeatedly e-mail or write to you. Worst of all, you may get constant visits from different police officers making yet more threats if you don’t INVOLUNTARILY attend their VOLUNTARY interview. It’s obvious that this is a deliberate abuse of the procedures governing voluntary attendance which is why I discourage everyone from accepting them. Especially if you know that allegations have been made against you. Voluntary interviews are usually an attempt to get you to incriminate yourself, or somebody else, where no evidence would otherwise exist. Despite what the police say, they are not an opportunity for you to ‘put your side of the story’, ‘help them with their enquiries’ or ‘get the facts straight.’ They are an evidence gathering exercise for the benefit of the police, so they can interview you without having to go through the procedural inconvenience of making an arrest. These informal chats are anything but ‘informal’. No sooner have you arrived at the station you will be taken to an interview room and then cautioned. Every word you say will be recorded. Although you will be told you are free to leave whenever you wish, should you try to do so partway through the interview – or voice anything that sounds like an admission of committing an offence – you will be arrested. Voluntary interviews therefore are a form of quasi-detention, with an additional benefit to the police inasmuch as you are unlikely to have a solicitor present (Even though you are entitled to free legal advice when agreeing to a voluntary interview). Invitations to the station are also misused as a method of luring people to their arrest who would otherwise be protected if they refused to leave their homes. This is because the police cannot use force (without a warrant) to enter someone’s home to arrest them for a summary offence, such as harassment, common assault, minor public order offences and most traffic offences. This doesn’t seem to deter the police from routinely turning up at people’s homes and ‘tricking’ them outside by barking orders and demands that give the wrongful impression that the ‘suspect’ has no alternative but to surrender his or herself to the police. The police cannot arrest you simply for refusing to agree to a voluntary interview. Nor do they have any the right to detain you on your doorstep (or have a right to remain when you have asked them to leave) without lawful authority. This is where the Cop Zapper letter comes in. It serves as an official notice to remind the police where their actions give rise to civil liability. 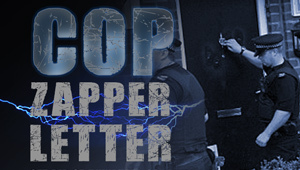 The Cop Zapper isn’t just an A4 page of empty threats, it is a carefully drafted legal document which outlines all the various laws, civil torts, codes of practice, and codes of conduct the police are flouting when they use oppressive means to coerce people into complying with unlawful demands. It also invites the police to describe in detail what it is they wish to discuss, thereby giving you the opportunity to submit a response or statement if you so choose. We have sent this letter out on behalf of many readers of this site who have used our Action Against Police service, with 100% success. Which is why we are offering it here for just a £4 fee. As long as it used to prevent the police from abusing their authority in making repeated and unwanted communication or visits, for either a summary only offence or on matters where they ‘just want to speak with you’, including the issuing of harassment warnings, then there is no reason this letter should not be successful for you too. 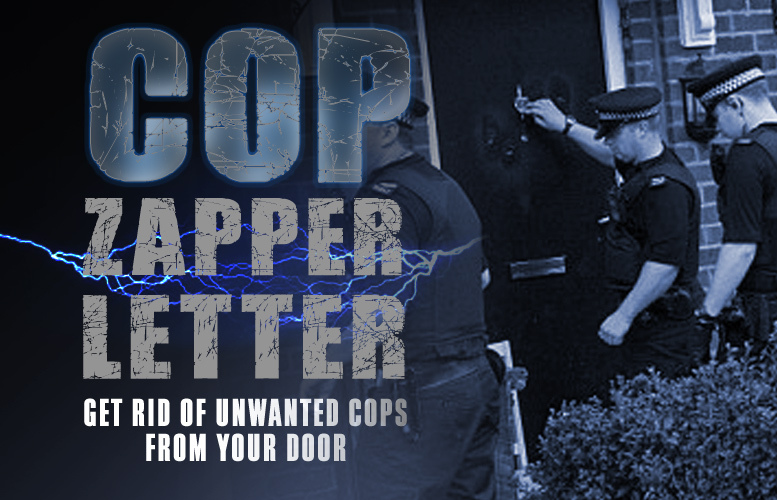 In the unlikely event the Cop Zapper doesn’t serve it’s intended purpose, then just e-mail us and we will assist you, for free, until you get the intended results. Until the police learn that they do NOT have the automatic right to bully us on our doorsteps or plague us in our homes without lawful authority, they will continue to act in whatever manner best serves them, rather than serves us. So take action, stand up to the police. Download this letter right now for just £4. Every penny we raise from products sold here, are used to support and maintain this website, providing resources and advice to others. Just click on the Paypal button to purchase. Once you have completed checkout click on the “COMPLETE PURCHASE” button and you will automatically be redirected to the Cop Zapper Letter which you can download as a pdf. This document will open on all devices and will allow you to cut, paste and amend it where required.